After our big tour of the town the day before, Kurt and I decided a nice relaxing day was in order, so we began the day by sleeping in for a very long time. I won’t mention how long. When we finally got up, the pool was calling our name. Consequently, we donned our swimming suits and set out. I have to say, this was the highest pool I have ever swam in; it was located on the roof of the 24th floor of our hotel. The pool itself, however, was nothing to crow about. It was an averaged sized pool without any real amenities; no palm trees, no lush vegetation, not even a real bar (although someone was selling beer out of an electric cooler). But it was water none-the-less. We noticed the day before from the top of the tower that the hotel was building a new pool on the roof of the 5th floor or so. This one looked as though it would be much more exotic. Kurt and I got our swim in at the existing pool, though, along with a bit of sun. The pool offered a great view of the mountains surrounding Vegas and also entertainment; you can find some very interesting people in Vegas… In all, it was just what we needed. Kurt and I decided to play it smart and left the pool before we got too crispy. Amazingly, we found we needed to lay down for a bit again! What a rough vacation. After resting and cleaning up, we set out to find somewhere to eat in our own hotel. Both Kurt and I were a little sore from walking so much the day before in shoes that we should have known not to wear. In fact, this caused us to worry slightly about our readiness for the Canyon. Because of this, we didn’t want to venture out too far. After a little wandering, we found an old 50’s diner, Roxy’s, and had ourselves a bit of a snack. To kill a little time after we ate, we walked through the shops in the Stratosphere again. Nothing had really changed from the day before so we decided to see if much had changed in the casino. Unfortunately Kurt and I managed to waste a few quarters while we were there. We tried a few different games, but none were as fun as the ‘double or nothing’ video poker we played at the Bellagio the day before. Kurt also surrendered to his adventurous side and attempted a game of Roulette, which neither one of us had ever played. To his chagrin, I have to say it was the fastest I have ever seen someone lose $20! Ouch. Eventually we changed for dinner (we had 10:30 reservations at the New Orleans Fish House – remember it’s fashionable to eat extravagantly late in Vegas) and caught a taxi (no more walking the strip for us!) to the MGM Grand, where the restaurant is located. Because we still had a couple of hours before the reservation and because the MGM was the only major casino we hadn’t been in yet, we decided to take a tour. Do I need to mention that there were plenty of slot machines? And poker machines, and betting tables… and kitties. Very large kitties. 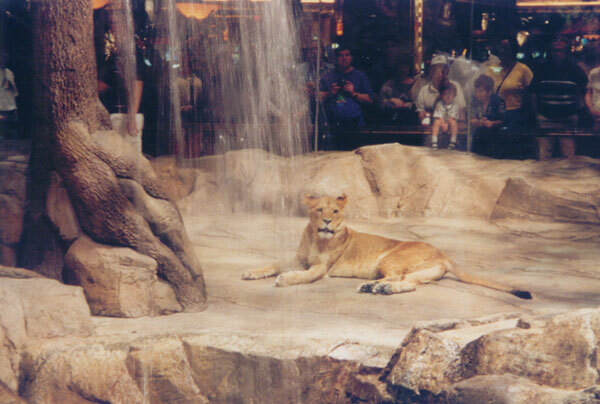 They had a huge, glassed-in cage with two half-grown lion cubs and their trainers. We discovered that there was a small walkway that extended into the cage area – this walkway was made entirely of glass – and one of the lions was laying on top of it! This lion was ‘playing’ with a large, red plastic ball. Well, OK. He was demolishing it, actually. We watched the lions for a while, and then decided to move on. Eventually we found the shopping corridors, which were very nicely designed I must say. We attempted to walk out to the pool, but it was already closed. I don’t think I mentioned that all the hotel pools appeared to close early, say 7pm. Our theory is that the hotels wanted to eliminate all distractions after dark, to bring you inside to spend your money gambling. Surprisingly, they sat us right away. The restaurant was large, open, well appointed and very modern. The server didn’t really impress us at first, however. For one thing, we had to ask three times for water. The menu was fairly well mixed: steaks, pasta, and seafood. More influence on the fish, of course. It’s a fish house after all. The prices were not extremely steep, but higher than an average restaurant. We hoped, however, that this was not your average restaurant. For the appetizer, we had a twice-baked truffled garlic potato. Kurt ordered a double cut pork chop for the main course and I ordered a dish with consisting of mussels, clams, and fried potatoes doused in a lemon butter sauce. Of course we had several cocktails (champagne, vodka tonics, wine and beer) with our meal. Unfortunately, we were way too full for dessert. Overall, the restaurant was good, but nothing incredibly outstanding. Since the night was still young, we thought perhaps we could use a few more drinks. Upon the recommendation of one of the waiters, Kurt and I attempted to head over to Mandalay Bay. Supposedly that’s where the action is on Sunday nights. However, we found ourselves next to a tram that could potentially take us to Bally’s – the opposite direction from Mandalay Bay. Since walking was still a difficult task, we sat ourselves down on the train and caught a free ride to Bally’s. Once at Bally’s, we wondered around trying to find a decent bar to sit down in and catch a drink. We had to wander all the way to the Paris Las Vegas before we finally saw a bar that suited our needs. It was right in the heart of the Paris Las Vegas, beneath the base of the Eiffel Tower. We each had a few beers (Kurt) and margaritas (me) and did a little people watching. Finally, we decided it was time to head back to the Stratosphere. Of course a taxi was in order again as we were way too tired, full, and relaxed to walk nearly 5 miles.